As you may know, I’ve lately fallen into the varied and fascinating world of JAFF – Jane Austen fan fiction. It’s a real thing! And it’s fun. The 1995 Colin Firth production of Pride and Prejudice, most particularly the lake scene, inspired a fervor for Jane Austen’s works – and P&P in particular – so great that her 6 novels have not been enough. There’s a whole world of spin-offs, reimaginations, prequels, sequels, and… mashups. You remember Pride and Prejudice and Zombies? Well, if you don’t, the movie is coming out soon! Long intro to tell you about a fun one I found while ::ahem:: researching the field. 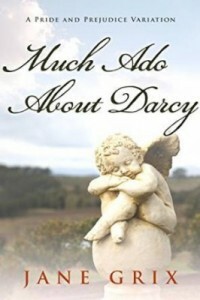 This is a mashup of Pride and Prejudice and Much Ado About Nothing. Very cute and fun, and I loved Mr. Darcy issuing Benedick’s speeches. Oh my!! One of my favorite Shakespeare plays + anything Austen = me-running-to-the-library-to-find-this-book!! !